ISOCARP actively supported the Philips Livable Cities Award which is a global initiative designed to generate innovative, meaningful and achievable ideas to improve the health and well-being of city-dwellers across the world. President Ismael Fernandez Mejia was part of the international supervisory panel of experts. Other panel members were Ken Livingstone, former mayor of London and Sir Ken Robinson. There were three award categories: Well-being Outdoors; Independent Living; and Healthy Lifestyle at Work and Home. On 28 April 2011 Royal Philips Electronics announced the winners. The overall winner of the Award, announced at a gala ceremony held at the world famous Rijksmuseum in Amsterdam, was Sabrina Faber from Sana’a, Yemen, for her idea `Rainwater Aggregation in Sana’a’. Read more about the winners at http://thecityfix.com/phillips-livable-cities-award-winner-rainwater-aggregation-in-yemen/. President Fernandez Mejia was present at the Award Ceremony on 28 April. A new featured group on the professional social networking site LinkedIn has been established to facilitate an issues-driven discussion among people interested in making cities more healthy and livable places. You can join the discussion group, called “Creating Healthy, Livable Cities,” by clicking here: http://bit.ly/LivableCities. In April 2010 ISOCARP signed a Partnership Agreement with the Philips Center of Health and Well-being. 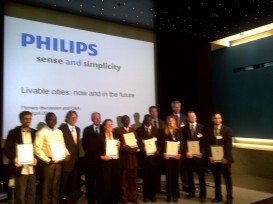 ISOCARP actively supported the Philips Livable Cities Award. President Ismael Fernandez Mejia was part of the international supervisory panel of experts and was present at the Award Ceremony on 28 April 2011 in Amsterdam.